What does it really mean to be a researcher? When we assign students a research project, how can we make the experience as authentic and engaging as possible? Critical exploration encourages learners to use their own observations and questions to construct new understandings. This is central to what researchers do. Yet in most conventional “research projects” assigned to middle school students, the focus is on cobbling together what other people have observed and organizing that information into an essay or display. Simply collecting facts and then presenting them in a different form is not the same thing as research. 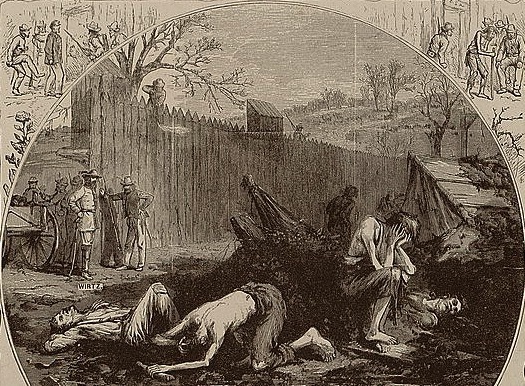 Thomas Nast, “Union Soldiers in Andersonville Prison,” 1865. The real game of a researcher involves digging up artifacts, observing them closely, and, as a result, arriving at new ideas and questions about the topic. Most middle schools expect students to practice gathering information about a topic on their own and organizing ideas into paragraphs. These skills lie at the heart of most research projects and are in fact valuable for students and historians alike, yet these skills alone do not constitute research. What would a research project look like if it involved actual research—if the ideas being organized had been constructed by the students themselves, rather than by editors of textbooks or encyclopedias? This is the question my colleague Lucia Krul and I set out to answer as we designed a research project this spring for seventh graders studying the American Civil War. Our aim was to infuse the habits and values of critical exploration, which encourages students to “play the real game” of research, into what was otherwise a fairly standard, traditional project for middle school. What follows are some thoughts about how I approached this project in my classroom and what I can imagine doing more effectively the next time around. As student-centered as critical exploration is, the teacher has important responsibilities: jumping in to see if he or she understands what the learners are thinking; encouraging them to grapple with inconsistencies in their ideas; and providing new artifacts or challenges based on where they seem to be headed. Yet in a traditional research project setting, in which each student follows a unique path, the teacher is not able to be present to fulfill these responsibilities throughout every step of every learner’s journey. Consequently, much of the questioning and seeking out of new artifacts must be done by the individual students themselves. To prepare my students for this, I first had to engage them in the process. I facilitated a number of critical exploration sessions in the weeks preceding the research project. For example, with only a sparsely labeled map related to the Missouri Compromise of 1820 (the eventual unraveling of which helped precipitate the Civil War), the class built on each others’ noticings and wonderings to figure out the complex terms of the compromise—terms that, when read about in a reference book, are often difficult to conceptualize. Subsequently, the students identified what they might have overlooked or not really understood had they received the information from others rather than constructed the understandings themselves. Later, as a Civil War unit review, small groups of students encountered various photographs, political cartoons, newspaper clippings, and other images that I had compiled from the era. The students took turns sharing noticings and wonderings about them, calling upon their existing knowledge of the Civil War to help them make better sense of the images and the topic itself. Through this process, they began to develop the mindset they would need for the upcoming research project. For the project, Lucia and I asked each student to research a Civil War-related topic of his or her choice and produce a digital “exhibit” using Adobe’s PDF Portfolio application. After a brief overview of the topic, a student’s exhibit would feature three artifacts, each accompanied by an analysis of how it might enhance our understanding of the topic. Fortuitously, my school’s librarians, Cathy Farrell and Brian Parry, had spent many years teaching these students the practice of “previewing” resources prior to selecting a research topic. Consequently, the students began this project not by choosing a topic but rather by exploring a variety of Civil War artifacts, generating keywords and questions in order to find additional topic possibilities. The students did consult reference materials such as encyclopedias, but they did so typically as an outgrowth of their initial explorations. An “artifact” could be any primary source: a photograph or cartoon, newspaper article, speech or letter, map, poem or song, and so on. I allowed for artifacts that were not strictly primary as long as they contained minimal text and had rich exploratory potential; this left room for maps and paintings created long after the war. The students enjoyed learning how to use the library’s subscription databases, Google Advanced Search, specialized websites, and books to find artifacts. The Civil War was a fantastic topic for this type of project because of the wealth of diverse resources. The analysis accompanying each artifact had to identify some things the student noticed about the artifact, how these noticings led to new understandings through further research, and unanswered questions or “mysteries” arising from the exploration. These requirements served to maintain a focus on discovery, theorizing, and questioning, as opposed to “reporting,” which is often a middle school student’s first instinct in a research project. The emphasis on further research deriving from an initial exploration helped to establish another important principle of the “real game” of research: the idea that it’s a continuous process that builds over time, rather than a finite period of gathering sufficient information and then reporting it. By requiring students not only to notice and question but then to use their noticings and questions to jump back into the research, I hoped to have the students become, in a sense, their own teachers. Lucia and I also incorporated the concept of thesis-based argument into the project. After compiling a half-dozen or more promising artifacts, the students were to include only three of them in their exhibits. How were they to choose? Our answer was to ask them to select three that, together, could enhance our understanding of some specific “theme” related to their topic. At the end of each analysis, the students were to explain how the artifact communicated their chosen theme—similar to using evidence to support a thesis. The students’ eventual themes ranged from the general (“The risks of being a spy”) to the particular (“General Sherman’s dislike of the press” or “Doubts about the Anaconda Plan”). Some students leapt into the challenge enthusiastically, emboldened by their freedom to explore. For those who began more grudgingly, my aim was to steer them to artifacts (and, from there, topics) that might engage them. Once some of the more reluctant students found topics that truly interested them, they emerged as some of the most committed, thoughtful researchers in the class. For much of the research time, Cathy, Brian, and I circulated around the library, supporting students in their inquiry but trying to avoid the temptation to “push” them in directions in which they were not already headed. Accordingly, my responsibility was similar to that of a teacher during a formal critical exploration session: figuring out which ideas and questions were likely to be the most generative and helping the learners find paths they could explore further. 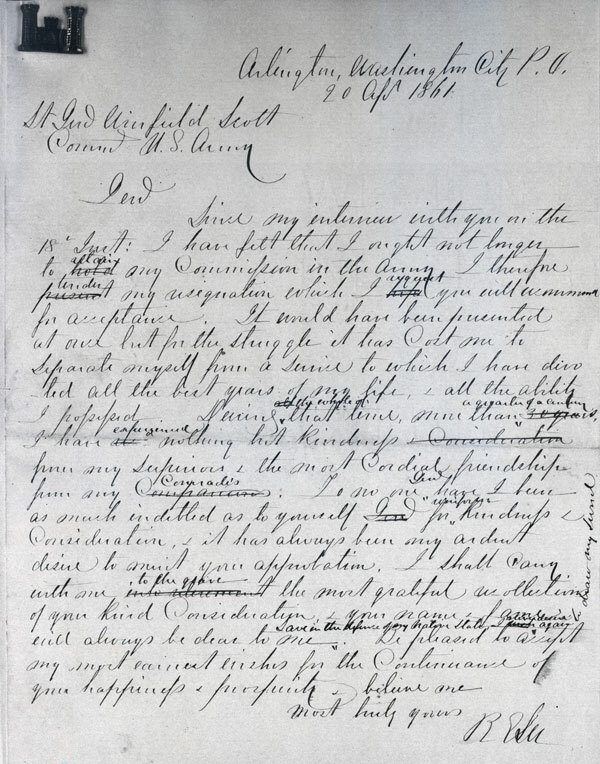 Robert E. Lee’s letter to General Winfield Scott explaining his resignation, April 20, 1861. I included a range of assessment criteria, from timeliness and organization to the relevance of the artifacts to the chosen theme. Yet the central objective of the project—constructing knowledge through research—meant the exhibits succeeded as long as they stayed true to that spirit. I did not evaluate the exhibits on the breadth of their content, keeping in mind David Hawkins’s assertion: “You don’t want to cover a subject; you want to uncover it.” I had to remind myself to care less about which pieces of information a student covered than about which questions a student posed, and how the student went about addressing them. Unfortunately, the deadlines for this project ran up against the end of the school year, so I did not have time to do justice to what should be its final stage: full-class critical explorations of each other’s artifacts. As I imagine it, the teacher would begin by facilitating an exploration of the most generative artifact and then strategically add more artifacts to the exploration in response to the noticings and wonderings of the group. The student whose artifact is being explored might observe silently at first and later write a reflection comparing his or her own analysis to that of others. I look forward to timing the project more wisely in the future so that my students can reap its full benefits. Another challenge that emerged for me during the exhibit drafting stage was helping my students to recognize the difference between using artifacts to illustrate newly obtained knowledge and using artifacts to show how new knowledge had been constructed. This project, of course, asked students to do the latter, yet in more than a few cases, analysis drafts essentially started with, “This is a photograph of George McClellan. Now let me tell you all about him…” As I worked with students to revise their drafts, I often encouraged them to focus more intently on using the images, text, and other aspects of their artifacts as anchors of their analysis rather than simply as accompanying illustrations. Next year, if I create opportunities for students to practice this type of analysis more regularly throughout the school year—not just in the weeks prior to the project—they might be more uniformly successful at demonstrating it in their own writing. This brings me to my last point, which is that we must not expect perfection. We must not expect it of ourselves, the teachers, as we can always identify a time when we offered too much or too little direction. We must not expect it of our students, who necessarily demonstrate varying degrees of sophistication as we ask them to experiment with a method that many adults spend years of higher education attempting to master. And we must not expect it of any assignment or activity, given the expectations and constraints of most schools and curricula. As I wrote at the outset, the aim of this project was not to remake the curriculum but rather to infuse the habits and values of critical exploration into activities that otherwise would not benefit from them. Next year, I will try to align this project even more closely with Eleanor Duckworth’s vision of teaching and learning. And the next year, even more. And I will learn a lot about the Civil War in the process! Duckworth, Eleanor. “The Having of Wonderful Ideas.” In “The Having of Wonderful Ideas” and Other Essays on Teaching and Learning. 3rd ed. New York: Teachers College Press, 2006. Hawkins, David. The Roots of Literacy. Boulder: University of Colorado Press, 2000. p.79. Perkins, David. Making Learning Whole: How Seven Principles of Teaching Can Transform Education. San Francisco: Jossey-Bass, 2009. p. 9. Mike Fishback earned his Ed. M. from the Harvard Graduate School of Education in 2006 and currently teaches seventh grade history and English at The Potomac School in McLean, Virginia. Love the project and would like to try out something similar with my students. I am curious about the assessment end of things. Did any of your students in this research project come up with “incorrect” understandings of the materials they had selected? If so, how did you deal with that in terms of correcting them or assessing them? This is a terrific question. Since the content of the students’ analyses focused on using the artifacts to support their own hypothesizing and wondering rather than reporting facts, there were few opportunities to display inaccurate information. Whenever something in a draft was clearly inaccurate, I simply called the student’s attention to it so it could be corrected; this didn’t really factor into the assessment of the product because it took place during the revision process. However, there were a few instances where I did feel compelled to “correct” a student’s understanding, and in doing so, I tried to stay as true as possible to the values of critical exploration. For example, one student, in researching General Grant, selected a political cartoon depicting the complicated politics of Reconstruction, which happened after the Civil War and encompassed Grant’s subsequent presidency. Our class had not yet studied Reconstruction, and as a result, this student misunderstood major aspects of the symbolism (at least as I understood it, knowing quite a bit about Reconstruction). I started our conversation by asking him to talk me through his analysis of the cartoon. For someone who hadn’t been exposed to the “correct” context, he really had a strong grasp of how the various components of the cartoon fit together in his mind and what the message of the cartoon was. Yet as he explained it to me, he began to recognize that a few pieces of the logic didn’t make as much sense as he had thought, and consequently, he had trouble bringing his analysis full-circle. To paraphrase Professor Duckworth, something’s not a problem unless it’s a problem. Here, in full view, was this student’s problem! He was now ready to think actively about other possibilities, so I decided to introduce the topic of Reconstruction, giving him a short overview in a few sentences. As I spoke, I could see light bulbs turning on in his head: Ah, this is why that didn’t make sense! Ah, now I get what that person symbolizes! And he was able to explain the whole cartoon, within this new context, right away, because he already was so familiar with every inch of the image and already had a strong sense of the relationships between the depicted characters. He went off and revised his analysis quite successfully. The main theme here is that it’s the thinking itself, not the accuracy, that we should assess. In my opinion, this student’s thinking was impressive precisely because he was able to use his previous understanding of the artifact to help him make better sense of it once he encountered more of the context. This is neat – thanks! I’m wondering about your reflections on having students search through what sounds like a huge trough of potential sources for them to study. In the future, would you put any limiting parameters around the selection of sources? You mention allowing for certain kinds of secondary sources as well as close support from teachers, so I’m curious about other things you might recommend to someone else trying this that might help make sifting through so many sources as productive as possible for students. Thanks for your question, Scott. Regarding the searches themselves, the librarians and I spent a significant amount of time teaching our students how to generate effective keywords for digital searches and how to use the index of a reference or nonfiction book. We provided them with a list of particularly rich websites and databases and collected many Civil War-related books with illustrations and primary source documents that we kept in a cart in the library. Those students who might have felt overwhelmed by the volume of potential sources were able to take advantage of the narrowing we had done in preparation for the project. As I mention above, one challenge in facilitating this project was getting the students to distinguish between artifacts that illustrate what they already know and those that help them explore further. The fact that many of the potential artifacts were accompanied by captions complicated this task considerably. This is why I emphasized the idea of “mysteries,” as in the question, “What mysteries arise from your observations of this artifact?” One reason I selected Jack’s and Ellie’s excerpts for inclusion above is that they show how this emphasis can expand the parameters of a student’s analysis — from Lee’s priorities to his commitment to them, or from Barton’s worldview to her family influences. So even though the focus was on primary sources, in truth the type of artifact did not matter as much as how generative it was, how much further one’s thinking could progress by puzzling over the artifact. Most students did end up selecting exclusively primary sources, the main exception being maps and paintings (though even some of these were primary). And in cases where the source was secondary, I often provided feedback that asked who had created the artifact and what relevance the creator’s identity had to the student’s interpretation of it. In the era of digital teaching, most educators have been focusing on the skill of synthesizing lots of information into a coherent whole, and I believe this skill is incredibly important. Yet another important skill, showcased here, is deciding which websites, texts, and images are most helpful to the type of research or learning you are trying to do. So in a way, the “sifting through,” as you put it, is part of the challenge and the educational experience!